Nikki Novak sits down with James Corden, star of 'Peter Rabbit' and host of 'The James Corden Show,' to play a game of finish this movie quote. The cast of 'Peter Rabbit,' including James Corden, Elizabeth Debicki, Domhnall Gleeson and Rose Byrne, play of game of Read My Lips with host Nikki Novak. 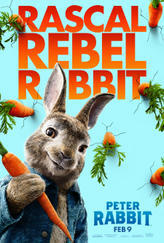 Peter Rabbit is now available on digital platforms including FandangoNOW. Looking for movie tickets? Enter your location to see which movie theaters are playing Peter Rabbit near you.